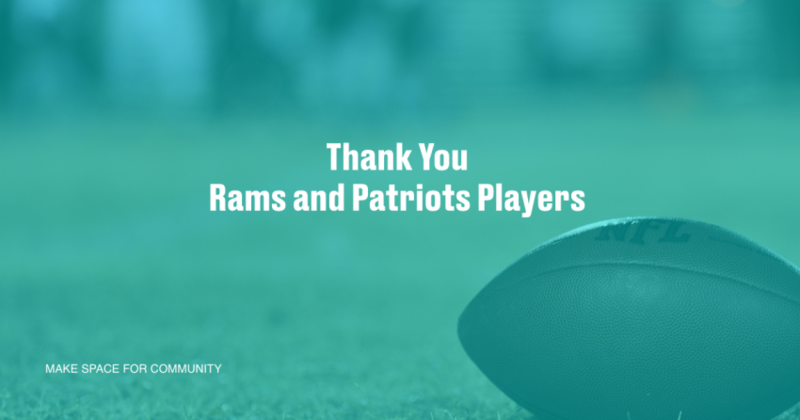 With so much focus on who wins and loses the game Sunday, we think it’s equally important to recognize the contributions that many of these players make in their communities all year long. 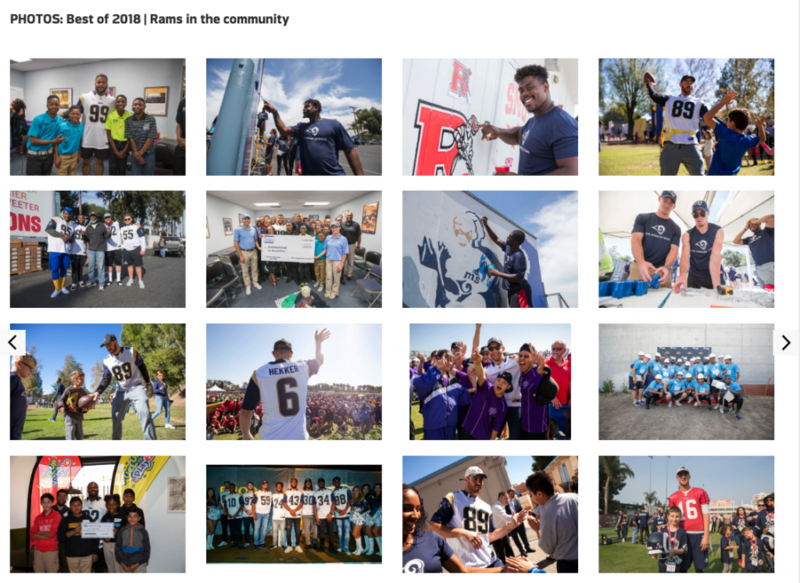 On TheRams.com community page, we found an impressive slideshow of LA Rams players contributing to their community. After-School All-Stars, American Cancer Society, American Heart Association, American Red Cross, A Place Called Home, Big Brothers Big Sisters of Greater Los Angeles, Big Sunday, Boys & Girls Club of Orange County, Cedars-Sinai, Children’s Hospital of Los Angeles (CHLA), Children’s Miracle Network Extra Life, City Year, Club 21, CollegeSpring, Conejo Valley Unified School District, Educators 4 Excellence, Exceptional Children’s Foundation, FirstBook, FOOD Share of Ventura County, Habitat for Humanity of Greater Los Angeles, Habitat for Humanity of Orange County, Habitat for Humanity of Ventura County, Heart of Los Angeles (HOLA), Homeboy Industries, HomeLight Family Living, I Have A Dream Los Angeles, Inglewood Unified School District, Inner City Arts, Green Dot Public Schools, L.A. Family Housing, L.A. Kitchen, L.A. Promise Fund, LA’s BEST, Las Virgenes Unified School District, Los Angeles Conservation Corps, Los Angeles County Alliance for Boys & Girls Clubs, Los Angeles Education Partnership, Los Angeles Regional Food Bank, Los Angeles Ronald McDonald House, Los Angeles Unified School District, Make-A-Wish of Greater Los Angeles, Make-A-Wish Tri-Counties, Merging Vets and Players, Mission Continues, My Stuff Bags Foundation, Operation Gratitude, Operation Progress, Orange County Boys & Girls Club, Partnership for Los Angeles Schools, ROSIES Foundation, SalvationArmy, San Fernando Valley Rescue Mission, Sharefest, Skid Row Housing Trust, Special Olympics of Southern California, St. Margaret’s Center, St. Vincent de Paul, Sunshine Kids, Susan G. Komen, The Midnight Mission, Tragedy Assistance Program for Survivors (TAPS), UCLA Operation Mend, United Way of Greater Los Angeles, Uplift Family Services at Hollygrove, Vision Zero, Watts Bears, World Police and Fire Games, Wounded Warrior Project, YMCA and YWCA. On Patriots.com Community Page, the New England Patriots display a number of impressive accomplishes through their Patriots Foundation. The New England Patriots Charitable Foundation is the nonprofit organization established by Robert Kraft in 1994 to support charitable and philanthropic agencies throughout New England. This support comes in the form of direct grants and the donation of signed memorabilia to charitable causes, and from Patriots players who offer their direct support by appearing at charity functions throughout the year. ​The Foundation’s primary goal is to support programs that aid the youth and families of the New England region by assisting programs that foster cultural diversity, education, family and health. The Foundation has taken special interest in youth programs that encourage education, creativity and development of character. LifeSpace wants to thank all the players, coaches and owners who make space for their communities all year long. We encourage fans to get inspired to volunteer in their communities through their favorite team’s community outreach programs, or by contacting their favorite charity or organization directly.